Watching a talented young player explode on to the scene for the first time is one of the most exciting things about football. When a youngster emerges and immediately shines among his more experienced peers, supporters understandably get a little giddy. At the start of every new season, a fresh batch of wonderkids seem to materialise ready to showcase their skills and potential to the watching world. Reputations are quickly earned as people clamour to witness the game’s “next big thing”. With club football taking a short exhale during the second international break of the season, we thought we’d take the opportunity to share some information about 10 of the most exciting young players who have been making waves this season. Talented Argentine midfielder Alexis Mac Allister comes from a family with plenty of footballing pedigree. The 19-year old is the son of former Boca Juniors hero Carlos Mac Allister, while his brothers Francis and Kevin are also on the books at Argentinos Juniors. Alexis is the pick of the bunch however and his intelligent use of the ball and mature appreciation of space have put him on the radar of some of Europe’s biggest clubs. 21-year old Brazilian attacking midfielder Lucas Paqueta made headlines this week when his current club Flamengo accepted an offer in the region of €35m from Serie A side AC Milan for his services. 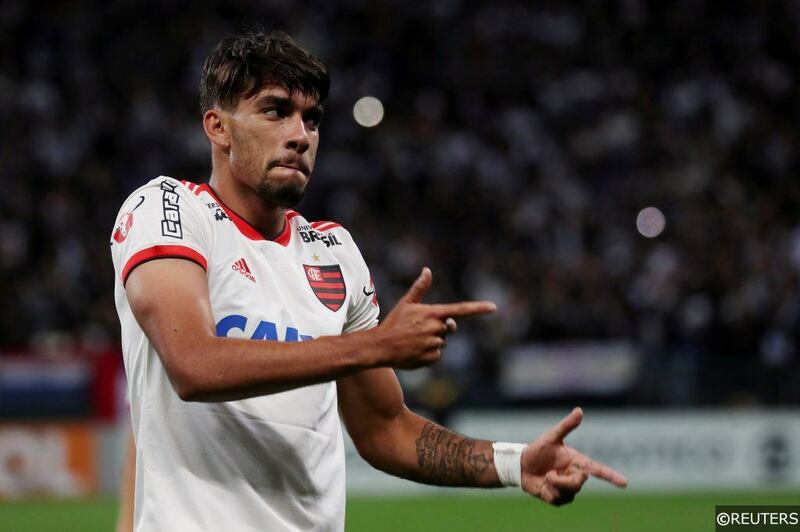 Paqueta has been blazing a trail through the Brasileiro this year, scoring 9 times in 24 games from midfield. Paqueta’s talents have been recognized at international level too, and the youngster pulled on the Seleção shirt for the first time in September in Brazil’s friendly against the USA. Portuguese giants FC Porto are famed for their ability to scout and sign the next wave of South American talent. Their scouting network is the envy of many and in Eder Militão it looks as though they have unearthed another gem. Porto lost two right backs in the summer to Premier League cubs, with Ricardo Pereira and Diogo Dalot joining Leicester city and Manchester United respectively. The deals brought over £40m into the club coffers, and Porto spent just £3m of that to bring Militão to Portugal. The 20-year old has been sensational in the early throes of his European club career and his performance earned him a debut for Brazil’s senior team against Ecuador last month. Dutch champions PSV signed Brazilian left back Angeliño from Manchester City in the summer transfer window, paying a little under £5m to land the 21-year old. Angeliño enjoyed a fantastic year on loan in the Eredivisie last year with NAC Breda, though the spell was his 4th successive temporary stint at another club. City decided to cash in on the youngster in June, though his early performances in a PSV shirt hint that the Citizen’s might live to regret that decision. Angeliño has been superb for the Boeren, laying on 3 assists for his team mates in 8 league starts so far in 2018/19. Danish left winger Jacob Bruun Larsen has scored 3 goals and racked up 2 assists in just 4 starts for Borussia Dortmund in 2018/19. With competition for places in Dortmund’s front line intense, the 20-year old has been feeling his way into first team action over the past month. The impact he is making in the minutes given to him by Lucien Favre is undeniable however. Larsen scored 1 and made 1 of Dortmund’s 3 goals in their Champions League win over Monaco, despite being on the pitch for only 45 minutes. The attacker, who has represented his country from U16 right through to U21, looks ready to cement a more regular spot in the Dortmund starting XI. Javairo Dilrosun is the second ex-Manchester City academy star to make our list. The 20-year old Dutch winger moved to the Bundesliga in the summer after his contract with City expired and Dilrosun hasn’t looked back. Initially Dilrosun played with the Hertha Berlin second string team in the lower reaches of the German football pyramid, but after making his senior debut as a substitute against Schalke on September 2nd, Dilrosun has been a regular. The former Ajax youngster has 2 goals and 3 assists in just 5 starts to Hertha and the pacey forward played a starring role in the club’s recent 2-0 over champions Bayern Munich. Described as a mix between Michael Essien and Yaya Toure, defensive midfielder Ibrahim Sangaré has been drawing admiring glances from some of Europe’s most prestigious clubs this season. The 20-year old has been a shining light for Toulouse in Ligue 1 since the summer in the heart of their midfield, combing brawn with silky close control. Sangaré has averaged 4.3 tackles per game in Ligue 1 this season – only Marseille’s Kevin Strootman and Caen’s Adama Mbengue have made more tackles on average than the Ivory Coast international. This is likely to be Sangaré’s last season at the Stadium Municipal, though next year he is expected to cost much more than the €8m Atalanta offered for him in June. Espanyol have made a tremendous start to their La Liga campaign, sitting in 6th spot just behind Real Madrid after 8 rounds of fixtures. One of the key components of their team and most impressive performers has been holding midfielder Marc Roca. The 21-year old, who was schooled at Barcelona’s famous La Masia academy, has completed 89.8% of his passes this season and his composed displays for the Periquitos since the summer were rewarded with a call up to Spain’s U21 squad in September. Languid 21-year old centre forward Sam Lammers joined Heerenveen on loan from PSV Eindhoven for the duration of the 2018/19 season, though his performances so far suggest that his long-term future lies with the Dutch champions. Lammers has scored 5 goals in 8 Eredivisie games since August, including 2 goals just last weekend in Heerenveen’s 5-0 win at De Graafschap. Lammers had been a prolific scorer in PSV’s youth setup, though he is enjoying something of a breakout season at senior level in 2018/19. Netherland’s Head Coach Ronald Koeman was so impressed with Lammers’ performances, that he handed the striker his first call up to the Dutch senior side for their games against Germany and Belgium this week. Flying Brazilian winger Wenderson Galeno has been the pick of the bunch in an overperforming Rio Ave team in the Portuguese Primeira Liga this season. The 20-year old is on loan at Rio Ave from FC Porto, having stood out as one of the best players in the club’s youth setup. The Brazilian is comfortable operating on either flank, and has provided 4 goals and 2 assists for Rio Ave in just 9 appearances for the club. Galeno ranks in the top ten for average key passes per game, average shots per game and average dribbles per game in the Primeira Liga in 2018/19. Categories: Blog and Football. Tags: best young players, players to watch, top 10, and wonderkids. Team Tag: Argentinos Juniors, Borussia Dortmund, Espanyol, FC Porto, Heerenveen, Hertha Berlin, PSV, Rio Ave, sao paulo, and toulouse. Sports: Football.